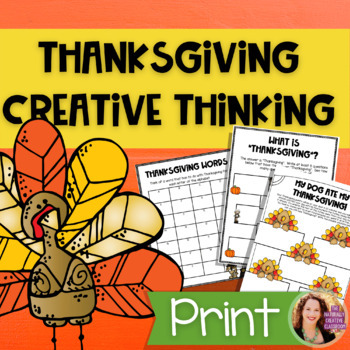 20 creative thinking, writing and math Thanksgiving activities for Thanksgiving. This Thanksgiving Activity Pack is geared towards 3-5 grade, but could be used to challenge more advanced 2nd graders. These language rich Thanksgiving activities may be used individually or stapled together to create a packet (black line cover included). Fostering creative thinking has been shown to increase learning in all areas. You are Such a Turkey! - What if you were a turkey? How would your life be different? Thanksgiving Problems- What are the disadvantages of Thanksgiving? Thanksgiving Garment- List the attributes of Thanksgiving and the attributes of jeans. Create something new! Baking Bind- Oh NO! Your oven broke! What are some other ways that you can cook Thanksgiving dinner? A Turkey and an Ice Cube- How are a turkey and an ice cube alike? Thanksgiving of the Future- What will Thanksgiving be like in the future? My Dog Ate My Thanksgiving- Company is on their way over and your dog ate your turkey. What are some ways you can still have a good Thanksgiving? Aren't You the Cutest?- You are keeping track of how many times your cheeks get pinched this Thanksgiving. You can't use a paper or a pencil. How can you keep track? The Mysterious Dessert- an ice cream cake with a burning candle shows up on your Thanksgiving table. No one knows how it got there. Give three possible explanations. 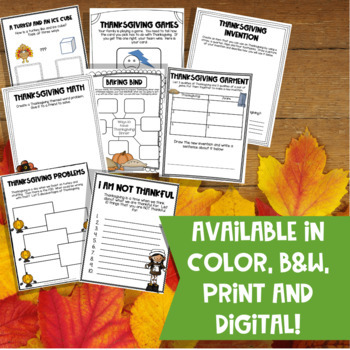 Sample Answers included with these Thanksgiving activities to get you and your class thinking! A Product Descriptor is included for easy grading! These Thanksgiving activities makes a great Thanksgiving early finishers packet! Use these Thanksgiving activities as sponge activities to get your students thinking. Set up some Thanksgiving centers around or on Thanksgiving using these Thanksgiving Activities. If you like this Thanksgiving Activities pack, check out my Thanksgiving Bundle available in my store. 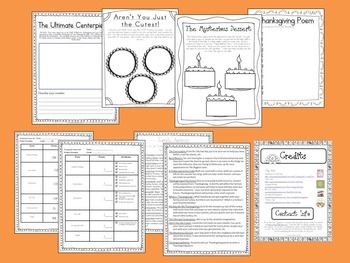 It includes this and three other Thanksgiving themed packs for math and language arts! Save 15% when you bundle! How to Cook a Turkey: Thanksgiving Writing Project.